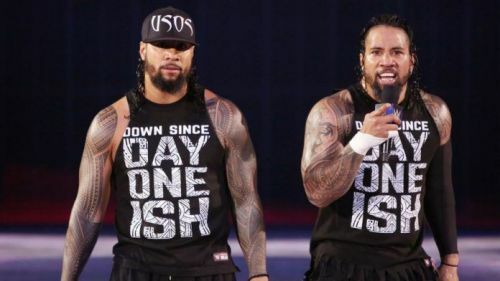 The Usos still spit fire on the mic. The entire Shane McMahon/Miz storyline is the worst thing on Smackdown Live, and while there is a lot of fans that love the Miz being a babyface and Shane being his partner that supports him to gain his father's respect, it's all just too much of an unnecessary narrative that WWE has crafted. This narrative with Shane McMahon and The Miz has destroyed the years of heat Miz has worked so hard to build, and why WWE would do something like that, well, who knows? But one thing positive that came out fo this feud was the insertion of The Usos in the Smackdown Live Tag Team Title picture, as Jimmy and Jey are too good to be sitting on the sidelines doing nothing. In fact, WWE should have drafted them to Raw a long time ago; maybe they could have saved that tag team division. Nevertheless, The Usos are back in action, and one of the things they do so well is build up a narrative in one segment, as the mic skills of Jimmy and Jey are just immaculate at this point in their career, and on Smackdown Live they brought the heat. While this segment was not anything classic, it did hype up the match between The Usos and the team of Miz and McMahon. Even when this segment went off the rails at a few times as these two teams were bickering nonstop, it was during a few times in this segment The Usos really touched on some crucial points that created a narrative for this match. And that was the claim of Shane and Miz calling themselves the best tag team in the world, The Usos took offence to that claim by the new Tag Team Champions, and laid them out with two huge superkicks. This was not intricate booking by any means, but it was effective in getting the job done.